Standing in your kitchen with one eye on the clock as you frantically try to chop, peel and prep. vegetables and meat for dinner, fills no-one with joy. Fine if you have all the time in the world and are not going to be put under pressure by a towering 6ft teenager who practically has steam coming out his ears because yet again he is STARVING. Not only are the children all verging on collapse because they’ve had ‘nothing’ to eat all day but you only have 30 minutes before you’ve got to don your ‘taxi’ cap and get on the road again for a sports fixture. This is my life at the moment and it’s set to continue thus for a few more years until they decide I’m redundant. Meanwhile I’m continuously trying to come up with quick, easy yet balanced and filling meals and the tribe have declared this one a triumph. Zero prep. Really? Yes, nothing! Unless you count cutting a lemon in half before you squeeze it and making up a jug of chicken stock, that’s all there is to it. No peeling, no chopping just straight-forward no-fuss cooking. 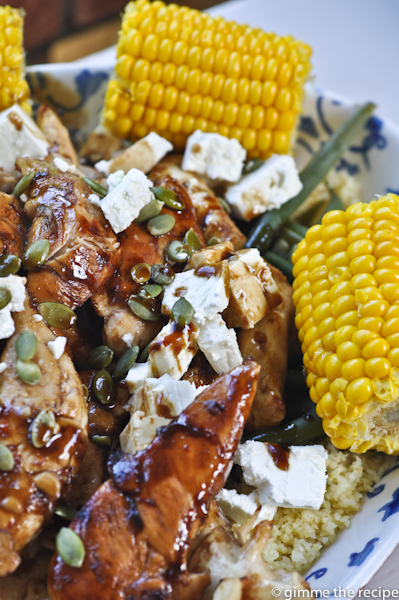 Mini chicken fillets are a key ingredient here as they cook so much more quickly than full chicken breasts. If your brood are of the particularly ravenous variety be sure to accompany this with some fresh crusty bread to fill any gaps. I simply don’t have time for weighing of ingredients here and judge most things by eye so you may want to check the pack of bulgur wheat for quantities of wheat vs stock and likewise you decide how much chicken and veg. you need to satisfy your audience. Err on the side of making too much as leftovers will be perfect eaten either hot or cold. Place the mini chicken fillets on a cooking tray and drizzle with oil and scatter over chilli flakes or stir through some chilli paste. Place in the heated oven and leave to cook for 10 minutes. Make up the quantity of chicken stock needed for the amount of bulgur wheat you are cooking (I use a large glass measuring jug for this) add the bulgur wheat and cover the jug with cling-film or tinfoil to keep the heat in. Leave to stand for 5 minutes or until all the stock is absorbed. Squeeze the juice from the lemon. Take the lid off the bulgur wheat, fluff it up with a fork and stir through the lemon juice, cover again to keep it warm. After the mini chicken fillets have been cooking for 10 minutes remove tray from the oven, drizzle chicken generously with honey and balsamic vinegar and return to the oven for a further 10 minutes. Meanwhile cook the sweetcorn halves in a saucepan of boiling water, they should cook in under 10 minutes. Cook the sugar snap peas and green beans in a saucepan of boiling water and drain. 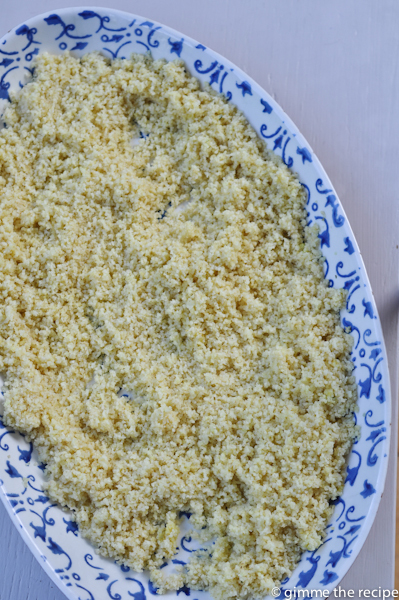 When everything is ready place the bulgur wheat in the base of a large serving platter. Top with the cooked green vegetables and then the mini chicken fillets along with all the juices. 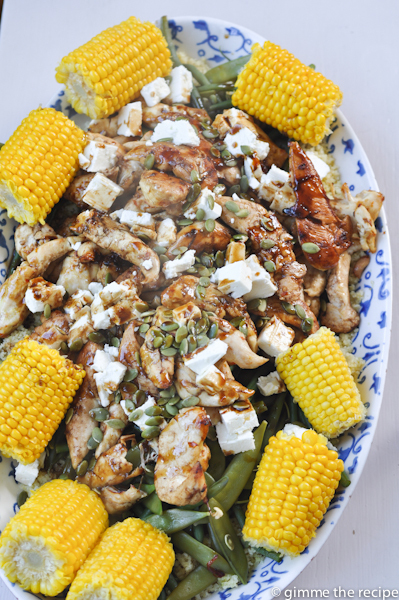 Arrange the sweetcorn around the edges, crumble over the block of feta and scatter sunflower seeds over everything and serve. I’m in the post-taxi phase. Last night, we had steak and onions for two. That meant a lot of chopping as we had a full net of onions. Delicious in its simplicity. Simple is best. One of my kids wears swimming goggles when he’s chopping onions! Hilarious but effective.